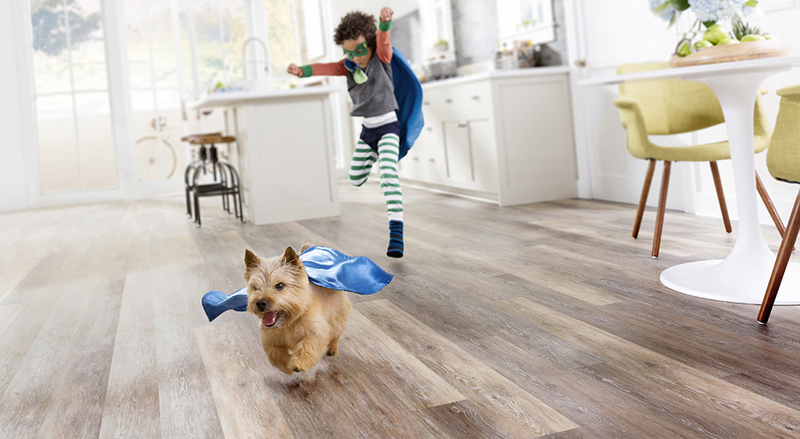 Flooring Must-Have for Pet Owners | Outer Banks Floor Covering Inc.
Flooring customers with cats and dogs are quick to mention that they’re pet owners. Maintaining a floor shared by an aminal in the home can be difficult but it’s not impossible. And just because you love your pet, doesn’t mean you have to sacrifice style! Below you’ll find exactly what you need to make you and your furry friends happy. This is a must for homes with large or energetic dogs. A luxury vinyl plank with at least a 20 mil wear layer will help keep your flooring looking good as new! Plus, LVP is safer to vacuum, which is particularly important for homes with long-haired pets. Regardless of the floor, pet owners are in for a fair amount of cleanup. A flooring option that can be wiped up easily with an average cleaning product is a major win! Frequent cleaning plus lots of play time amounts to plenty of wear and tear. Flooring with a solid, stable click-lock system and sturdy planks, like luxury vinyl tile, will be better equipped to withstand all the joys and woes of pet ownership. Sometimes what a floor really needs is a good ol’ wet mopping, especially when it comes to pet-owners! This is out of the question for carpet and hardwood flooring, but opting for a fully waterproof luxury vinyl means the occasional puddle won’t cause permanent damage. Most dog owners are familiar with it – you throw a ball across a smooth floor and Skittles slides into a wall, or worse, tumbles down the stairs. Flooring with an embossed wood grain helps her to get a grip. Contact Outer Banks Floor Covering to find the perfect floors for you and your pet!